"Help Santa Claus delivering Christmas presents"
Christmas time brings the magic to our homes every year with different things. There is no doubt that one of the most important characters of Christmas is Santa Claus. We all wait for the presents of this charismatic old man that comes from the cold Northern European lands. We think about what are we going to get this year but, have you ever thought about how hard is it for him to deliver all the presents? In Christmas Eve Crisis, you will find out. 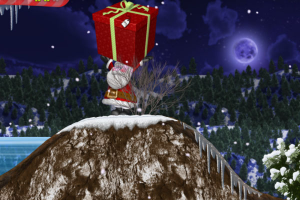 This game is about helping Santa Claus giving in the Christmas presents. Christmas Eve Crisis is an original game that will make you have fun for a while. Getting in a house is not that easy, even for Santa Claus. You will have to avoid mouses, owls, glow worms and others. Try to make it over 10 different levels and bring the magic of Christmas to all the houses. There is a ranking of your scores, and you will enjoy of some nice graphics while playing this game.